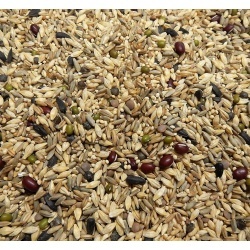 A mix of the highest quality of sprouting seeds for your fids nutritional needs. A specifically chosen blend, allowing even fids with allergies to enjoy the nutrition obtained from eating fresh sprouts. We've eliminated sunflower seeds and any form of wheat for our allergy feathered friends in our Avian Naturals Original Sprout Mix. All seeds were chosen for their nutritional value and for their ratio in like sizes to make sprouting for your fids a pleasurable experience, allowing the seeds to all sprout as evenly as possible. Using cold water, soak overnight an amount you will use within a day or two, rinse a few times, drain and serve for an easy and nutritious snack and top with a sprinkle of Herbal Supreme for added nutrition. Don't leave in cage more than 4 hours and even less in the heat of summer. Refrigerate any leftovers. You do not need to wait for the tails to appear. Generally most birds will prefer and accept soaked seeds much quicker than actually waiting for the seeds to sprout plus soaked seeds are at peak nutrition before tails appear. 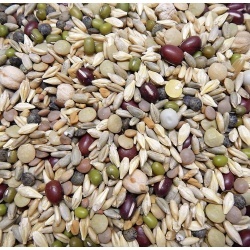 A mix of the highest quality sprouting seeds for your fids nutritional needs. A specifically chosen blend, allowing even fids with allergies to enjoy the nutrition obtained from eating fresh sprouts. We've eliminated sunflower seeds and any form of wheat for our allergy feathered friends. Ingredients: Organic Fenugreek, Organic Kamut, Organic Red Lentils, Organic French Green Lentils, Organic Blue Lentils, Organic Spring Rye, Organic Barley, Organic Oats, Organic Mung Beans, Organic Adzuki Beans, Organic Garbanzo Beans, Organic Green Pea, Organic Radish. Using cold water, soak overnight, rinsing a few times, drain and serve for an easy and nutritious snack. All the birdies say: Wow Mom! Generally birds will accept soaked seeds much quicker than actually waiting for the seeds to sprout plus soaked seeds are peak nutrition. 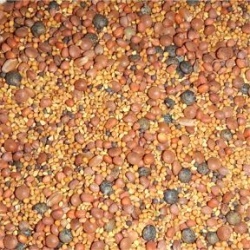 A mix of the highest quality sprouting seeds for your fids nutritional needs. Super Spicy little sprouting seeds for our small fids health. Ingredients: Organic Lentils, Organic Radish, Organic Alfalfa, Organic Red Clover, Organic Canola and Organic Mustard. Using cold water, soak overnight, rinsing a few times, drain and serve for an easy and nutritious snack. Georgie says, nice and spicy!! Generally most birds will accept soaked seeds much quicker than actually waiting for the seeds to sprout plus soaked seeds are more nutritious.